Ice Cream Archives - Mega Cone Creamery Inc. While the snow and cold are still lingering spring is just around the corner. That means, in a short period of time it will be perfect weather for ice cream. Of course, not just any ice cream will do. There are so many amazing ice cream shops in Canada that it’s worth a bit of a road trip to find the best. Here are seven places to get ice cream in Canada. Sweet Jesus is one of the best places to get ice cream. They have several locations, mostly in Toronto. However, there are at least seven new locations opening up in 2018. They even have a location in Baltimore, Maryland, in the US. Their goal is to combine, “conceptual thinking with high-quality ingredients and products,” so that you can taste something unlike anything else you’ve ever tasted. They also make cakes and even their own beer like the Mocha Marshmallow Stout with 6.2% alcohol. Those who might be offended by their name needn’t be. The name derives from the exclamation of enjoyment shouted when someone tries their ice cream. Moo Moos ice cream is still made by hand. While it’s still a small shop located in St. John’s, New Foundland, it’s worth taking the trip. They sell premium scoops of ice cream, pies, cakes, cookies, and tubs. They even make their ice cream at their location. Best of all, if you have food allergies, this is one of the safest places to get ice cream. Their knowledgeable and helpful staff can help you avoid your triggers. If you decide to stop by, finding their store should be easy, it looks exactly like a black and white cow. Rain or Shine Ice Cream is the best places to get ice cream if you’re looking to do a good deed and get free ice cream. They’ve teamed up with the Canadian Blood Services to offer a “Pint for a Pint”. Donate a pint of blood, get a pint of ice cream for free. They make their ice cream in-house using fresh, natural, and sustainable ingredients that have been sourced locally. They’re also known for putting some interesting ingredients like beer in their ice cream. Their flavors change quick, especially their seasonal flings. Stop by now if you want to try a sample of their Rosemary Olive Oil with Candied Pine Nuts. If a cone isn’t your thing, you can also get sundaes, milkshakes, and cakes at Rain or Shine, and they even cater events. Dutch Dreams has been part of the Toronto community for over 25 years. During that time, it’s consistently been one of the best places to get ice cream for the whole family. Their store was fashioned in the Dutch style to pay homage to their family ancestry. Walking into the store is akin to walking into a child’s fantasy and it’s a fun place to check out for tourists and locals alike. They have passed down their pancake and waffle recipes for generations and it’s all made in-house. Being culturally aware, they also offer 32 flavors of ice cream that are kosher. For those who can’t or don’t eat ice cream, they also offer an assortment of sherbet flavors. Homestead Ice Cream has been a fixture in Saskatoon, SK, since 1978. But they also have an ice cream truck they can rent out to you for events. They make ice cream, sundaes, novelties, and yogurt. Each of them is made in small batches on site. There are 40 varieties available at one time but they rotate through 300 different flavors. They even have a great flavor called “Flower Power” that’s lavender flavored. If you’re throwing a party, don’t forget to try their dish called, “The Dogs’ Breakfast”. It includes 14 scoops of ice cream, 6 sundae toppings, 2 bananas, cookie crumbs, sprinkles, nuts, whipped cream and a cherry. Cows is located on Prince Edward Island and is considered to be one of the best places to get ice cream on the island. That’s because the cow jokes are endless. They even sell items like t-shirts, pajamas, and beach towels with their name on it. Their flavors are both tasty and whimsical with flavors available like Bessie’s Pumpkin Patch and Cows Moochiato. They also have flavors like vanilla for those with more traditional tastes. For those not interested in ice cream, they also make and sell their own chocolates, gift baskets, and preserves. Don’t fret if you don’t live near PEI, they have 11 locations altogether, including one in Beijing, China. But even if you’re not located in Canada or Beijing, you can still enjoy Cows ice cream. They’re willing to ship anywhere in Canada, the US, and even worldwide. If it seems a bit pricey to have ice cream shipped to you from Canada, you still have an option to save. If you sign up for their newsletter, you’ll receive a 20% discount. Mega Cone is one of the best places to get ice cream because they come to you. Also, their ice cream trucks offer a wide variety of amazing and tasty ice cream treats. If you’re looking to wow your employees, renting a Mega Cone truck for an event will ensure that everyone has a great time. They’re also perfect for birthday parties, fundraisers, and even weddings. 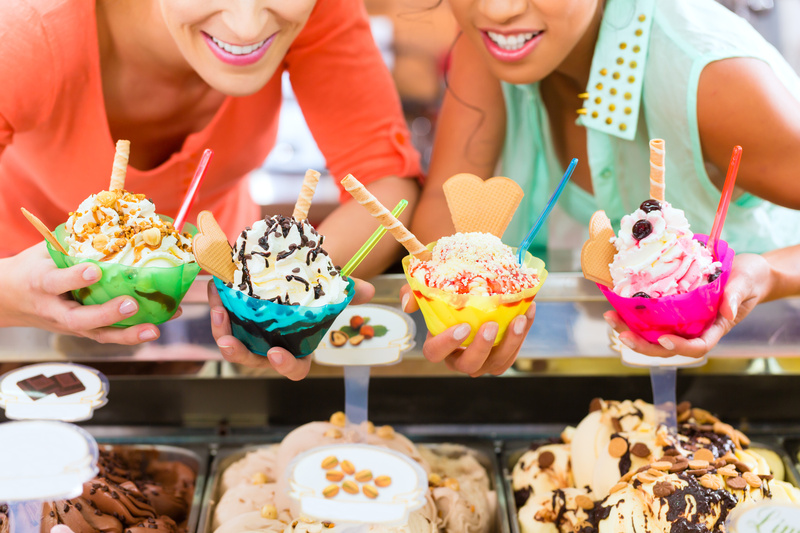 Mega Cone offers every type of cold treats you can imagine like soft-serve, parfaits, banana boats, and ice cream sandwiches. For those guests who don’t enjoy or can’t eat ice cream, they also serve slushes. Ready to Scream for Ice Cream? Don’t wait until spring has arrived to book one of our trucks. They can book up quickly, especially once the weather turns warm. Contact us now and give us the details of your next gathering. We’ll be glad to help you deliver an experience none of your guests will quickly forget.